KAUNA‘OA BEACH: At the Mauna Kea Beach Hotel. HAPUNA BEACH: Just outside Kamuela town and popular for walking and body boarding, recently ranked No. 3 by Travel + Leisure readers on a list of the world’s best beaches for families. ANAEHO‘OMALU BEACH: Known as “BAY,” great for windsurfing and kitesurfing. KA‘UPULEHU BEACH at the Four Seasons Resort Hualalai. WHITE SANDS BEACH PARK: Near the Keauhou Resort, also known as “MAGIC SANDS” because the beach can quickly disappear during high-surf winter months, only to return in the spring. KAHALU‘U BEACH PARK: Kona’s most popular snorkeling beach. PUNALU‘U BEACH PARK: A well-known black-sand beach. MACKENZIE STATE PARK: In Pahoa, where there’s a lava-lined pool heated to 95 degrees Fahrenheit by a volcanic stream nearby. COCONUT ISLAND PARK: Near the Hilo Hawaiian Hotel, a local favorite for fishing and swimming. LAUPAHOEHOE POINT PARK: Created by a lava flow from Mauna Kea, it has a large grassy area great for camping. WAIPI‘O VALLEY’S BLACK SAND BEACH: Accessible only with four-wheel drive or on foot from the overlook. • Watch the ocean for at least 20 minutes before entering. • Take caution if you notice water moving rapidly or swirling, or if you see waves breaking far offshore. • Never swim or snorkel alone. • Strong currents near shore are the most frequent and dangerous hazards; areas near river mouths are particularly dangerous. • Obey warning signs; if lifeguards are unavailable, ask other beachgoers about potential hazards. • Locate the lifeguard station, emergency phone or rescue surfboard when you arrive at a beach and never turn your back to the ocean. 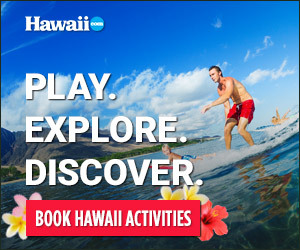 For the latest on beach conditions, go to hawaiibeachsafety.com/big-island.